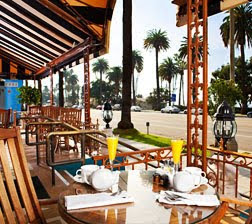 Built in 1933, the Georgian Hotel in Santa Monica, Calif., remains a favorite among celebrities like Oliver Stone, Robert DeNiro and Arnold Schwarzenegger. But even before it changed its name, the hotel was legendary as one of the first speakeasies in Los Angeles and a favorite haunt among people like Bugsy Siegel, "Fatty" Arbuckle, Clark Gable, and Carole Lombard. Perhaps it still is. While the hotel has downplayed the stories in recent years, there are some guests who have supposedly stayed on indefinitely. One site chronicles some of the unexplained, including loud sighs, gasps, and disembodied voices who greet people with a hushed "good morning." We didn't experience anything so verbose during our stay, but my family says they experienced something. It wasn't until after we booked our four-day stay at the Georgian Hotel that we found out about the local legend. And since my wife and I both enjoy Ghost Hunters, we were packing just in case: my wife's EMF detector and dowsing rods. Believe it or not, there were some strange occurrences. Every evening, the dowsing rods would spin frantically by the space at the foot of the bed. During the day, however, we could never duplicate the unexplained oddity. Both my wife and son also claimed to have been touched by someone or something unseen, leaving cool, tingly sensations for several minutes. Whether or not the hotel is haunted, the Georgian stands out in Santa Monica. The striking blue Art Deco boutique hotel (against a wall of white buildings) is a short walk from Downtown and the Third Street Promenade and to the Santa Monica Pier from Ocean Avenue. Immediately across the street, the palm-lined coastline park also features a pedestrian bridge for direct access to the uncrowded Santa Monica State Beach. The bridge crosses over the Pacific Coast Highway and descends north of more crowded beach parking. There is plenty of space to sit on a small wall separating a small lot and a biking path, just in front of the white sand. Other than the charming near-original mahogany-paneled elevator, the recent $5 million renovations are noticeable but not intrusively modern at the Georgian. The feel comes across a little more like the 1950s than the 1930s, but the intimacy that made the hotel famous is amazingly preserved. With only 28 suites and 56 guest rooms, hotel staff quickly become personal with guests, anticipating their needs by name and with pleasant smiles. Since the biggest buzz for the hotel came immediately following renovations in around 2004, the Georgian Hotel feels just off the beaten path. However, do plan ahead. Some summer nights are booked as much as one or two months in advance. Also, if you drive in, be prepared to valet. 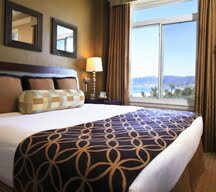 With its Ocean Avenue frontage, giving many rooms full ocean views, overnight parking is $21 (plus gratuity, for gracious guests). With the exception of check-in and check-out rushes, the valet is prompt and happy to pull the car around in between your breakfast on the veranda and picking up some essentials from the room before heading out to take in Los Angeles. Access to the entire city is exceptional from Santa Monica. 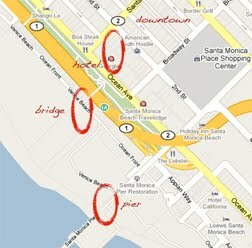 The less busy Pacific Coast Highway entrance is only two blocks east. The highway then becomes Interstate 10, which crosses Interstate 405 after a short ten-minute drive. Traffic is generally manageable, even if you are returning after a full day from downtown Los Angeles, Griffith Park, or Disneyland. The Georgian Hotel Hits An 8.8 On The Liquid Hip Richter Scale. The Georgian Hotel is the kind of place that writers, artists, actors, and free spirits look for to get away for awhile. It is also wired for WiFi, with hotel guests receiving the password upon check in. Another plus is that the lobby bar, which offers spectacular sunset views, is only open to hotel guests. Seriously, I wouldn't stay anywhere else in Santa Monica. To check for current airfares around Santa Monica, visit Fare Buzz flight pages.